Whitney, a seven-member indie rock band, will headline Summer Sendoff this year. Seeb, a Norwegian EDM trio, will serve as the opening act. 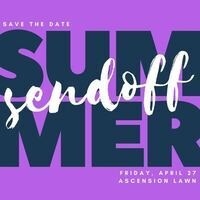 The event will include a cookout dinner and food trucks, starting at 4 p.m., giveaways from 5 p.m. and the concert will begin at 7 p.m.
Sendoff will be held primarily on the southern portion of the lawn between Peirce and Rosse Halls, close to Ascension Hall.